Due to the crazy amounts of snow the upper elevations of Southern Utah have received over the last two weeks I was left scrambling to find a new place to hike during the cold, snowy winter months and boy did I find it. In practically my back yard one can find peace, beauty and even natural free standing arches. During my research (thank you SCC for paying me to browse the internet) I found mention of a free standing arch. Basically all I found was one brief trail description and a couple pictures, but I decided that I would find this arch during my xmas break (thank you state of Utah and Washington County for giving me a two week xmas break this year!) Trevor and I made a quasi-attempt earlier this week but due to a snow/rain storm our excursion was cancelled. Luckily for me I did not give up hope but rather set out by myself on a cold December morning. Because of the lack of information of how to find this arch I found myself accidentally parking about 1-2 miles away from the trailhead, being lost for most of the time, finding myself somewhat stuck with the only option of sliding down a ten foot slab of slickrock, and scraping my knuckles up!!! But with a little determination I eventually found the needle in the haystack. 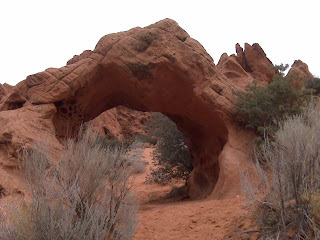 While the arch isnt very large, it is still impressive, especially for southwestern Utah. It is somewhat reminiscent of delicate arch although on a much smaller scale. Once I found the arch, I also found the trail out, which was much easier and faster than my scramble down the mountain trail.